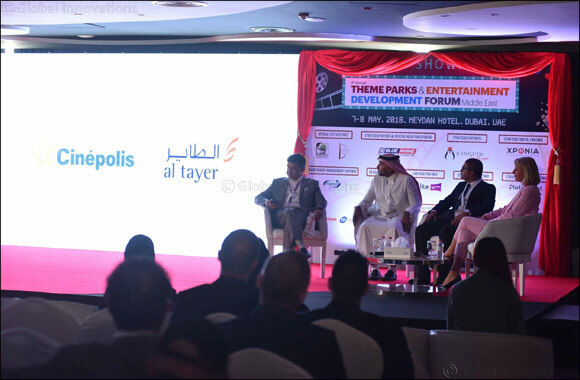 April 14th, 2019; Dubai, UAE: Eminent speakers across the Middle East’s entertainment and retail industry will converge at the 5th edition of Theme Parks & Entertainment Development Forum to highlight the UAE’s tremendous growth in the sectors and discuss the way forward. The two-day event will kick off on 16th April and continue till 17th April at The Meydan Hotel, Dubai, and will focus on the upcoming projects in the multi-billion dollar theme parks and entertainment industry. The Theme Parks & Entertainment Development Forum will be attended by leading theme park developers and industry buyers from UAE, Saudi Arabia and rest of GCC. Impressive line-up will include speakers from organizations such as Walt Disney Parks and Resorts, Farah Experiences, Miral, Saudi Arabia’s Ministry of Commerce & Investment, Al Othaim Leisure, Dubai Parks and Resorts, Global Village, Expo 2020, IMG Worlds of Adventure, La Perle, Dragone, Bounce Middle East, Legoland, DXB Entertainments, Power League Gaming and many more. Chris Ward, President, DepthQ by Lightspeed Design, Inc. - “DepthQ by Lightspeed Design, Inc. is very pleased to again participate in the Theme Parks & Entertainment Development Forum, our past participation strengthened our brand and created great opportunities for us. We look forward to presenting our innovative virtual reality work at this year’s show”. The event will be co-located with the 2nd edition of Malls Middle East slotted between 16th and 18thApril which will discuss challenges the industry faces in increasing footfall, enhancing customer experiences and the role of technology in improving the customer experience, among others. It will also include Interactive Group Discussions that will allow participants to discuss the various challenges. Both the events are being organized by IQPC Middle East. The Malls sector is large in the Middle East region and one that tourists identify with as part of the Middle Eastern experience, especially when it comes to UAE. According to a research by Euromonitor International, the retail industry in the UAE is currently worth $55 billion and is forecast to steadily rise to $63.8 billion by 2023. Malls alone contributed 11% of the GDP of UAE, amounting to $11.55 billion. They are not just places to shop and spend a few leisure hours with the family; they have become drivers of the economy. An Alpen Capital retail report states that the size of the GCC retail sector is expected to grow by 25 percent, from $250.5 billion (AED919.33bn) in 2016 to $313.2bn (AED1.15 trillion) by 2021, driven by economic and population growth, and increase in tourist arrivals. With billions being invested in up-coming malls projects, the region is driving the latest technologies and experiences for customers to enjoy with the all-under-one-roof concept. The event will have in attendance industry visionaries such as Mohammed Alawi, CEO, Red Sea Real Estate Development Solutions, KSA; Shane Eldstrom, CEO, Al Farwaniya Property Developments, UAE;and Sam Hosn, Director, Asset Management, Al Futtaim Malls, UAE, among others. Leading companies including Knauf, Vivaticket, Eaton, DepthQ by Lightspeed Design, Inc., Christie Digital, Strong MDI Screens, Ticket International, Semnox Solutions, GITech Conveying Systems, Hub Parking, Eclerx, Terraco, Avigilon and Wavesurfer will also showcase their solutions at the events.